Habit: Monoecious. Stem: prostrate to erect, 10--100 cm, generally many-branched, +- green, white when dry, moderately to densely woolly distally. Leaf: petiole 5--40 mm; blade elliptic to obovate or narrow-spoon-shaped, base wedge-shaped, tip obtuse to acute, margins flat or +- wavy; stem leaves generally deciduous, 40--80 mm, 15--30 mm wide, replaced by axillary leaves, 7--20 mm, 3--10 mm wide. Inflorescence: axillary clusters only, green; bracts 1.5--4 mm, 1.5--2 × perianth, lance-linear to awl-like, tip +- spined. 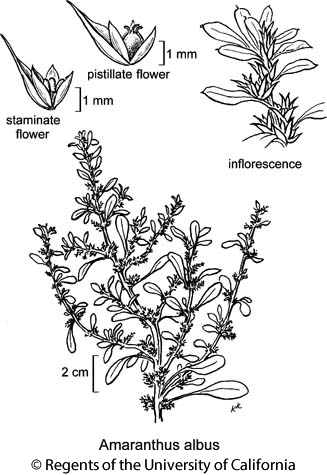 Flower: staminate flowers intermixed with pistillate, perianth parts 3, stamens 3; pistillate perianth parts 3, 0.7--2 mm, +- equal, lance-oblong to linear, tip acute; stigmas 3, erect. Fruit: circumscissile; 1.5--2 mm, >= perianth, ellipsoid-ovoid, green-white to brown, wrinkled especially near tip. Seed: 0.8--1.1 mm, lenticular, red-brown, smooth, shiny. Chromosomes: 2n=32. Citation for this treatment: Mihai Costea 2012, Amaranthus albus, in Jepson Flora Project (eds.) Jepson eFlora, http://ucjeps.berkeley.edu/eflora/eflora_display.php?tid=12892, accessed on April 21, 2019.